Microsoft may have shut down the original Xbox Live, but that hasn't stopped some gamers from keeping their connections alive. On April 15, Microsoft officially closed the doors on the original Xbox Live service, blocking internet access to all Xboxes. 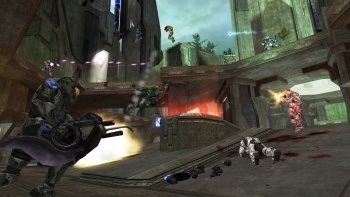 A number of gamers elected not to log off at all, and are instead remaining connected and playing Halo 2. These stalwart few have been online for the entire week since Live shut down and have vowed not to disconnect until they can no longer remain online, be it when their internet connections drop or when Microsoft manually kicks them off. A number of the gamers have posted streams (NSFW) of their final stand against Live's closure. While the numbers are dwindling there were at least 24 players hanging on at last count. For now it's unsure if their dedication and fortitude will outlast their internet connections, but at the very least Microsoft doesn't seem to be making any move to kick them off. Small victories, right?